In this interdisciplinary case, students meet Josie, the main character, who suffers from a variety of symptoms. Students must grapple with the conflicting data presented, which ultimately leads them to a diagnosis of either porphyria or schizophrenia. This case can be used in many ways depending on the focus of the course and the instructor. In its simplest form, it can be used to develop content-specific knowledge on the genetic illness porphyria and/or the psychological illness schizophrenia. In an interdisciplinary context, it can be used as a way to discuss complex modes of inheritance and types of confounding issues a genetic counselor, social worker, psychiatrist, or psychologist might face when trying to sort through a complex family history to develop a pedigree or genogram. 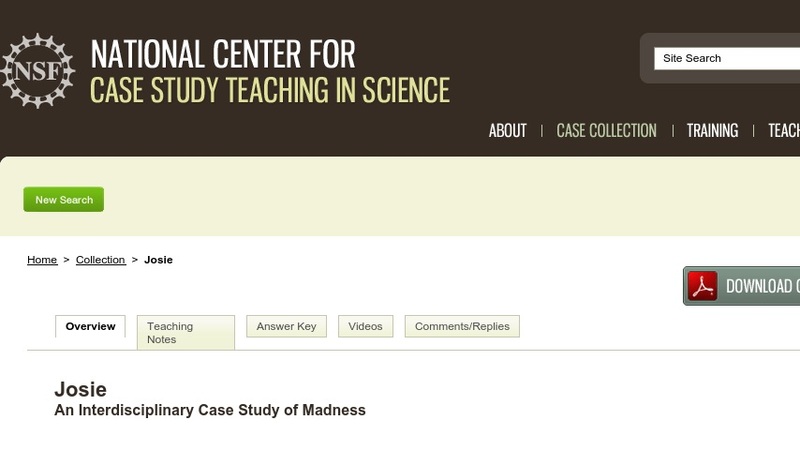 The case has been used successfully with majors and non-majors in psychology, biology, and genetics. Optional extensions to the case provide for reflection on the theme of "science in society" and how the perception of disease has changed over time.